Christmas is around the corner and I wanted to step up my game this year by going further than the usual string and icicle lights. So I thought I would try an animated projector light. So after much searching I settled on giving this one a try. The item arrived promptly from amazon costing £26.99 (current price £21.99), and well is pretty straightforward to setup and use. Just plug it in and use the little remote to turn it on. 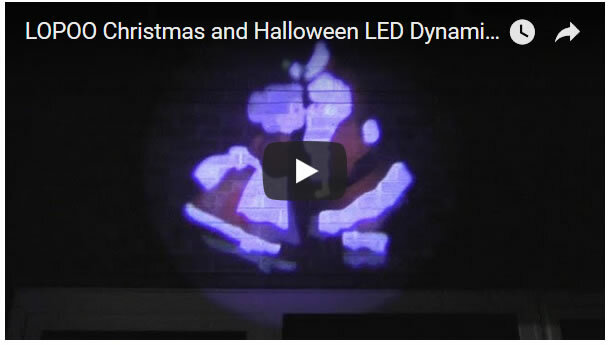 The projector comes with 12 slides, most are Christmas and Halloween, and a couple are for shopping and a US holiday. Firstly it’s bright! The image is bright and shows all the colours when shone on brickwork. Stuff like trees or a hedge will make the colour fade and the image dim a little. The effective range of the light is about 7 to 10 metres for a 6 foot diameter image. Watch the video for what to expect. I like it as it delivers what I was looking for Christmas and the bonus is that I can use it for Halloween too! In fact I like the Halloween slides better, pity I did not buy it a couple of weeks earlier.